Why Do We Want To Find Neutrinos, Anyway? They're hard to detect, but scientists are obsessed with doing so. Neutrinos are among the most abundant particles in the universe. They are also incredibly difficult to detect. In fact, they are so elusive that physicists all over the world can’t stop obsessing about them. In the past year, two experiments have returned the first results that show the obsession is far from over—and that the projects don’t need to be big to be scientifically mighty. Neutrinos are subatomic particles that are very similar to electrons, but they doesn’t have an electrical charge. Their mass is so small that scientists speculate it might even be zero. They also don’t interact much with matter, which is what makes them so difficult to detect. This all might make you wonder: Why are scientists looking for neutrinos, anyway? In short, it’s because they hold clues about the events and processes that created them—events that researchers are slowly trying to piece together. “Neutrinos tell us a tremendous amount about how the universe is created and held together. There’s no other way to answer a lot of the questions that we find ourselves having,” Nathaniel Bowden, a scientist at the DOE’s Lawrence Livermore National Laboratory, told NewsWise. Experts have compared the search for these particles to the work of archaeologists to reconstruct prehistoric artifacts in order to understand what life was like then. Better understanding of neutrinos could unlock secrets about other elements of astronomy and physics, from dark matter to the expansion of the universe. So scientists are convinced it’s worth studying neutrinos, and they’re willing to invest in large-scale projects to better understand them. The COHERENT experiment at the Oak Ridge National Laboratory, for example, contains five particle detectors, each about the size of a milk jug, designed to directly observe the highly specific interaction between neutrinos and atomic nuclei. Its sister experiment, PROSPECT, takes more precise measurements of the neutrinos COHERENT detects. Other, larger experiments in places like the South Pole use enormous machines and systems to catch traces of these mysterious particles. And though these projects make up the world’s smallest neutrino detector, they have already make some important discoveries. Last year, the researchers behind the two projects published a study in Science about interactions between two neutrinos that had been hypothesized decades before but never observed, according to a press release. We don’t know how much these experiments cost, but you might be tempted to say that whatever money was spent on them should be allocated towards something more directly relevant to human lives, such advancing medicine or fighting climate change. 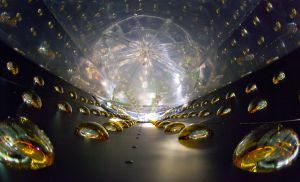 Neutrinos might not have the same headline potential of a new cancer treatment. But understanding them is key to our understanding of the universe. Neutrinos could help us identify other forces in the universe that we have not yet been able to detect or understand. They can teach us about the core of the densest stars, and could one day lead to the discovery of new astrophysical objects. If we can understand neutrinos, maybe we could answer some of the most essential questions in physics—at the heart of our very existence. Could We Levitate Humans With the World’s Most Powerful Acoustic Tractor Beam?